So you've chosen the date, the location and the guests - now it's down to the finer details that top it all off and make it your 'perfect' day. 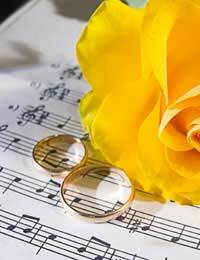 One of the things that you will have to consider is what music you are going to have accompanying you throughout the ceremony. But just where do you start? The first thing you need to consider is what kind of wedding you are having. If you're having a religious ceremony, then you are likely to be limited by the authorities who control the church, temple, synagogue or religious venue where the wedding is taking place. They will consider the ceremony to be a service of worship, and one that should be treated accordingly. Many churches are becoming more accommodating now with regards to ceremony music, and you may find that they are willing to allow songs that refer to love, marriage, and the values within - but of course, the final say will be theirs. If you're having a civil ceremony - maybe in a hotel, stately home or registry office, you will be able to have whatever music you like. However, it's a good idea to keep it appropriate to the occasion and make sure that you are both agreed on what's going to play and make sure that it doesn't form the basis of your first row as a married couple - after all, not many brides will relish the idea of walking down the aisle to 'Tragedy' by the Bee Gees or 'Vindaloo' by Fat Les! Classical music is always popular when it comes to welcoming guests into the wedding venue. Instrumental music is the most often chosen, but if you want something else - then it's really down to your personal choice. Take some time to listen to suggestions from friends and family, and listen to each piece of music at your leisure before making a choice. Of course everyone knows the sound of Wagner's Bridal Chorus - often referred to as 'Here comes the bride'. This is the most popular song to accompany a bride when she is ready to walk 'down the aisle' - but it doesn't have to be Wagner's classic though. In the film Muriel's Wedding, the lead character goes down the aisle to the strains of 'I do' by Abba. A popular choice in the late 80's/early 90's was the instrumental version of Bryan Adams theme from Robin Hood, 'Everything I do' - although you do need to make sure that you explain your requirements carefully. It would be easy enough for the song to be mixed up with the other Robin Hood theme tune - and who wants to walk down the aisle accompanied by 'Robin Hood, Robin Hood, riding through the glen'? To avoid a musical misunderstanding, make sure you are clear and precise about what you want, and don't leave any room for mistakes. Again, this depends on what kind of ceremony you are having. If you're having a religious ceremony, the music may well be an integral part of the service, and something that you can't change. In most church ceremonies, you will be expected to choose at least 2 hymns for the congregation to sing. In non-religious ceremonies you will not be expected to provide any music unless you want to. Of course, when the signing of the register takes place, it is a good idea to provide the guests who are not involved in the signing with something to listen to. Couples often prefer a piece from a soloist accompanied by gentle tones such as those from a harp or flute - either played live or from a recording. This type of songs allow hushed chatter amongst the guests and so are usually preferred, although a classical instrumental piece can go down just as well. Along with Wagner's Bridal Chorus on the way in, Mendelssohn's Wedding March is the traditional choice for the new husband and wife on the way out. If you know any good singer/songwriters, why not approach them and ask them to write or perform a song for your wedding - giving it a truly unique edge. Alternatively, you can think about hiring a small musical group - a string quartet, harpist or church organist to play your chosen music. Remember though that the music you choose can make a huge difference to the sense of occasion, so don't rush it and make sure it's perfect for your big day.